The Warka Mask has returned to the Iraqi National Museum in Baghdad. 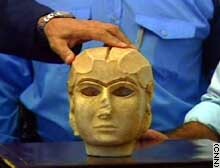 BAGHDAD, Iraq (CNN) -- U.S. and Iraqi officials Tuesday announced the return of the Warka Mask, billed as one of the most important artifacts looted from the Iraqi National Museum during the fall of Baghdad in April. The mask -- also know as the Lady of Uruk -- dates from about 3100 B.C. It was taken from the museum during the final days of Saddam Hussein's regime. Widespread looting of Iraqi treasures occurred after the successful U.S.-led invasion to oust Saddam. A joint investigation by U.S. military police and Iraqi police recovered it last week in an orchard a few miles north of Baghdad. "I am honored to receive this rare, precious and historic artifact and to hand it back to the museum to let it have its proper place amongst other rare artistic pieces," said Mufeed Omar Al-Jawad, Iraq's minister of culture. A tip from an informant led investigators to the man who had the mask, officials said. "The suspect admitted that he was in possession of the Mask of Warka and that he had buried it in his back yard," said Capt. Vance Kuhner, commander of the U.S. Army's 812th Military Police. "Iraqi police service members went up to the back yard with shovels and the dug up the Mask of Warka." The limestone mask is about 8 inches tall, and archaeologists said it most likely represents the goddess Inanna or one of her priestesses. A German expedition unearthed the artifact in Uruk -- modern-day Warka -- in 1938.